After your beginner course why not hire the equipment to get that extra practice. Windsurf equipment hire is available from us at Mudeford Quay throughout the summer. We have a great range of boards and sails, so the right equipment is there to suit most needs. At ShoreSports we pride ourselves on having the best equipment for our lessons and hire, which is why we have the latest kit from Starboard and Tushingham. 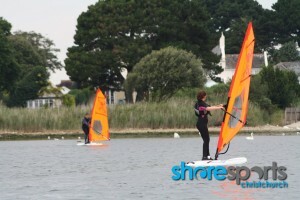 Christchurch harbour offers one of the best locations for windsurfing in the country. Its sheltered and shallow waters provide the perfect environment for both beginner and advanced windsurfers alike. The green at Mudeford Quay is the ideal location in which to launch, with a large grass area and plenty of parking. Day Hire 9.30 to 5pm: £40 for beginner kit. The 10 Hour Hire Card is a great way to to continue windsurfing after your beginner course. The card allows you to use both beginner and advanced equipment to help you progress your skills. Overnight hire available, please contact Nick for more information. Our hire prices include everything you need board, rig, wetsuit and buoyancy aids or harnesses. For more information click on Beginner courses and lessons.